After an hour trying unsuccessfully to dislodge a malfunctioning right main landing gear. it was landed on NLG and left MLG. No4 prop ripped off. No3 prop seriously damaged. Wing damaged. 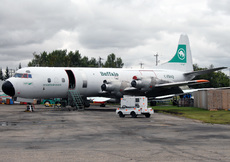 Fixed TV cameras were aboard for the Ice Pilots NWT TV series.